The idea of creating a palette from selected colors is not new but I keep on wondering why not more brands offer this. It seems pre prepared monster palettes are en vogue which is a concept I can never understand. Unless you are a make-up artist, the chances are slim that you will be using all tones of beige on your face. These also take lots of space and they are difficult to travel with. These are the reasons why I am welcoming Suqqu Face Designer Concealer Palette with open arms to my life and used it every single day since I got it. The packaging is sleek, can be tossed into the hand bag easily and the shades can be suited to your needs. There are 8 shades to select from. H shades are thought be for highlighting the high points of the face. There are three shades of highlighters: H-01 Clear White, H-02 Pearl Beige, H-03 Pearl Pink. 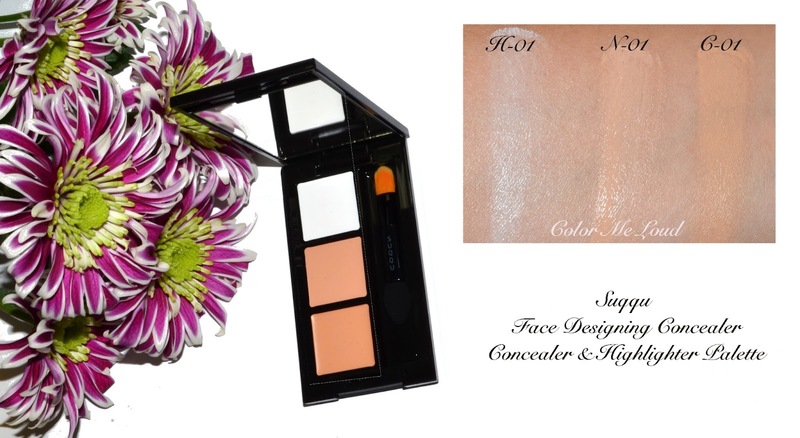 I went for the white shade which blends beautifully over my foundation and brings in light without having any shimmer. I think H-01 is best for lighter skin tones and combination skin since there is no shine but still the effect of highlight. H-03 is definitely on my wish list since I like a bit of shine with my dry to normal skin as well. H-01 might remind you of the illuminate shade of Tom Ford Shade & Illuminate Palette (reviewed here). Although I like the deeper shade in that palette, I was not happy with the consistency of the lighter shade which felt sticky after application. H-01 on the other hand is creamy during application and right after it magically sets and doesn't move. In the FOTD below I even applied it on my eyes to test and it worked. I don't know what kind of a japanese voodoo Suqqu is bringing here but if I were in charge of one of other luxury brands, I would totally send this one to the laboratory to find out how they did that. Very exciting stuff! N shades are said to be best for under area. You can understand why immediately after the swatch. They are very hydrating and they don't look heavy. There are three shades to select from: N-01 Natural Ochre, N-02 Dark Ochre, N-03 Orange Beige. I went for N-01 which is the lightest of the shades and it matches nicely on my NC-20 complexion. Without a doubt I can say that the formula of this one is out of this world. It is very hydrating, blends into nothing while covering really well. It also sets like H-01 in a magical voodoo-ish way. As for under eyes though, I need a bit more "peach" to cancel out my under eye darkness so I need a corrector under this one. 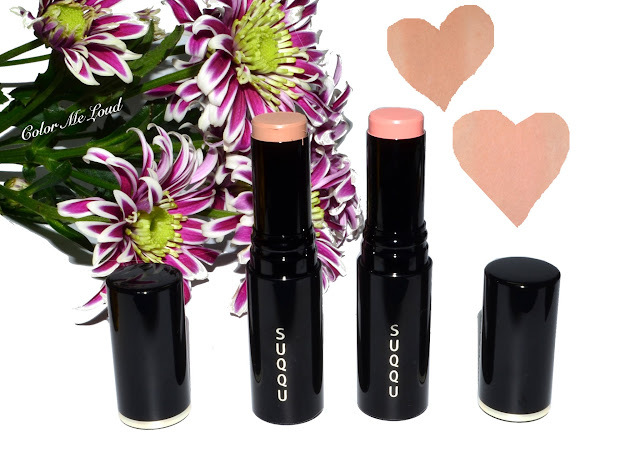 I am hoping Suqqu extends their range and offer some correctors for face acne and under eye darkness in the future. C-Shades have a thicker formula and are thought to be full coverage for face concealing. There are two shades, C-01 Natural Ochre and C-02 Dark Ochre. C-01 which I have is a little deeper than my skin tone but once blended it doesn't look very dark. This shade is not drying as some other full coverage concealers I tried, such as Laura Mercier Secret Camouflage. I usually don't have many spots to conceal with high coverage concealer so I am thinking to replace this pan with the pink highlighter or the orangy under eye concealer in the future. 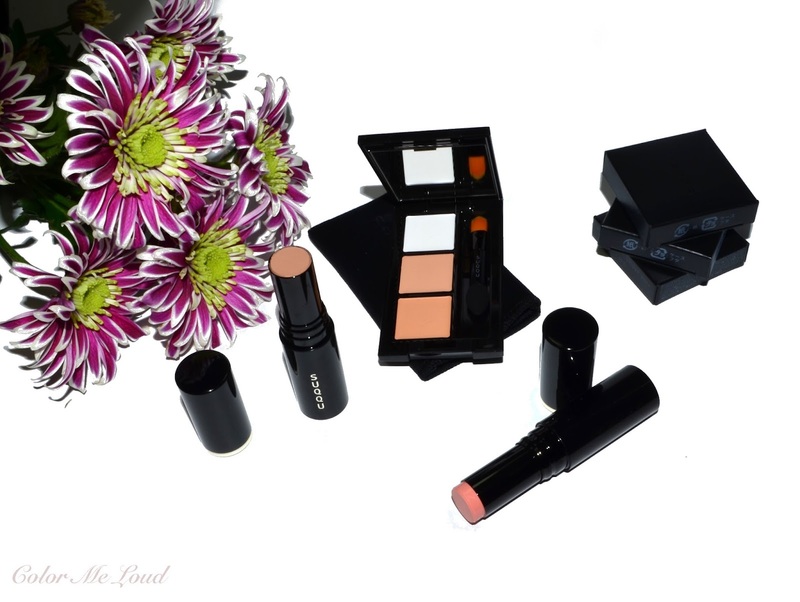 Now on to the blush sticks called Suqqu Color Foundation. These are so soft and lovely. I believe especially fair and light complexions will be all over these. These come in three shades. #01 is a orangy blush shade, #02 is a soft pink and #03 is a ashy tan to mimic the shades of the face. They can be applied directly from the wand onto the face and blended with fingers. I love the packaging, safe in the purse with a very chic and sleek design. Each blush stick contains in a 5.4 g of product and costs £24. Here you can see swatches of #02 and #03. Here is a super minimal makeup which shows once you get the base right, the rest is not so important after all. I am wearing the base as I explained above, Color Foundation 02 & 03 on the cheeks, Suqqu Face Designer Concealer Palette H-01 on the cheek bones and high points of the face, N-01 under the eyes and C-01 for a few blemishes. On my lips I am wearing Suqqu Creamy Glow Lipstick #13 Akanebara (reviewed here) which is my go-to Fall lipstick right now which I wore like 3 times last week. Talking about records, Suqqu Gel Eyeliner Pencil #02 in Dark Brown (review) is being used everyday as well. Below I am wearing it all around the eyes smudges with the sponge which comes at the back and other than that I don't wear anything on the eyes. Very unusual for me but I was smitten by how good it looked after all. I added just a touch of H-01 on the lids for some light, that was all. No crease work, nothing, voila, minimal make-up for strolling at the park yesterday. 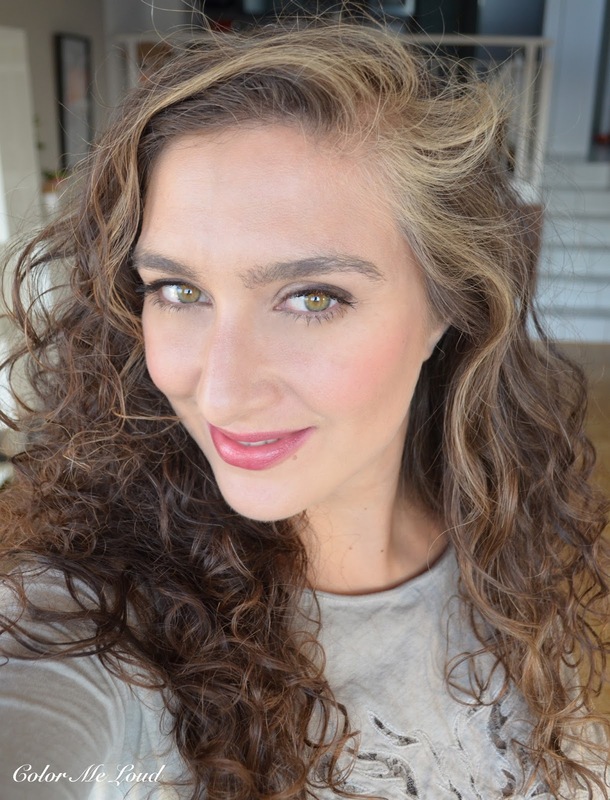 Oh and my face needs a bit more blusher so I added some from my By Terry Duo (reviewed here). Here is a one last look, what do you think? Aren't they pretty? 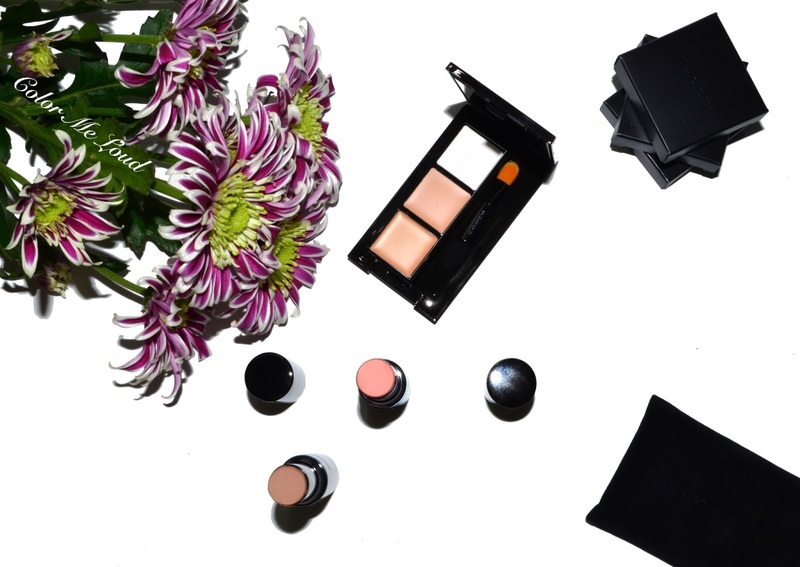 Final thoughts: Suqqu's take on perfecting the complexion is spot on with light weight, moisturizing products which set nicely without feeling sticky nor heavy. Sculpting stick is great for daily contouring which looks good in all angles. Thumbs up for the under eye concealer as well, great formula. New Suqqu base products are now available in Selfridges, Selfridges online, at Fenwick of Bond Street and Harrods. Do you like using palettes for concealing highlighting? I've actually never used any products from Suqqu but I've heard so much about it! I love the packaging and the product looks amazing! Love the FOTD. Your skin is glowing with a natural looking flush. I like this type of look. I wish Suqqu was available in the US. I will either have to pay a fortune in shipping costs or wait until my Dear Husband does a return business trip to Tokyo in the spring. FOTD? Just perfect! It is spot on perfect on your face, warm, sweet flush and natural and I dare to say, one of the best I see. Really. New H.G? Hello cheekbones! The result looks great! put it in your shopping list if you travel to UK or Japan. Or alternatively you might try to order one of their palettes from Selfridges. None of them really disappoint. This is a brand with almost no flops in their line. Big love. The sticks are great for your fair complexion, you will like them even more than I do. I can't wait to hear your thoughts on them. these two are not foundation sticks but they are stick blushes and contours with foundation formula, which is a great idea I think, it works wonderfully but the name is a little confusing. I know, I hope Suqqu is more available everywhere soon. I need a counter close by just to go and play with the products. During my travels to Japan my hubby can't separate me from Suqqu counters lol. It is such a blessing that your hubby is going there, start writing a long list lol lol. Thanks Melissa, I love the results too! this is really interesting many people said this FOTD was one of the best lately. You know what I started to think maybe I should go easy on eye makeup after all. The most distinct thing about this FOTD is that I am wearing no make up other than liner and mascara. Thanks so much for your lovely comment. What about meeting in London nest year, I am certainly planning it and Suqqu is to blame!